Still, let’s get onto reviewing the actual pie, not just the massive great size of it! 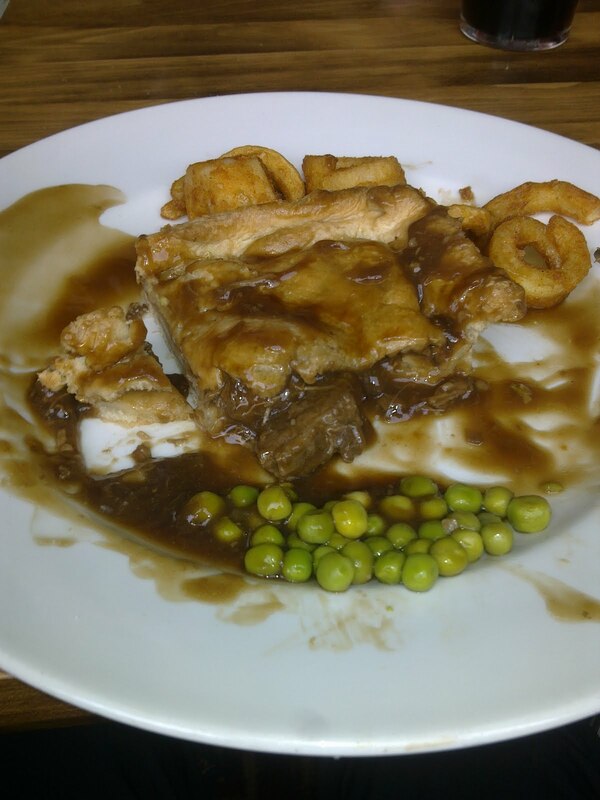 One immediate drawback as you can see from the photo is that this pie was doused with gravy for you, rather than giving you the option to carefully spread the gravy out where necessary by provision of a gravy boat. 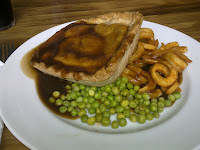 The pie did therefore come out a big soggy in patches, although the thick pastry certainly needed a bit of extra gravy at times to help it go down (it was a bit stodgy, but maybe you have to expect that for a 1lb pie?!) The wideness of the pie and lack of depth did mean the meaty chunks were crammed in a bit, but ensured a good capacity of pie. The gravy was good, if a bit excessive, and the meat was of a good quality and quantity (as you’d expect from a pie that weighs 1lb!) 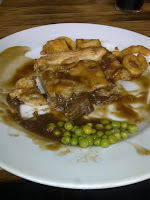 The pie was reasonably expensive, but as you were getting a big pie, it had to be trialled. Overall, it was a good big pie. There’s no need to give anyone the Sack after eating this pie, however you may want to hold back slightly on the Potatoes if you are going to finish off your whole 1lb pie.